If you are searching the best RODI system to add to your Aquarium equipments, you have landed on the right place to help you understand more and make a better choice before you purchase a reverse osmosis system for aquarium available on the market in 2018. Aquarium RO systems can be used to turn water that would otherwise be harmful for the health of your fish into water that can be used to fill your aquarium. 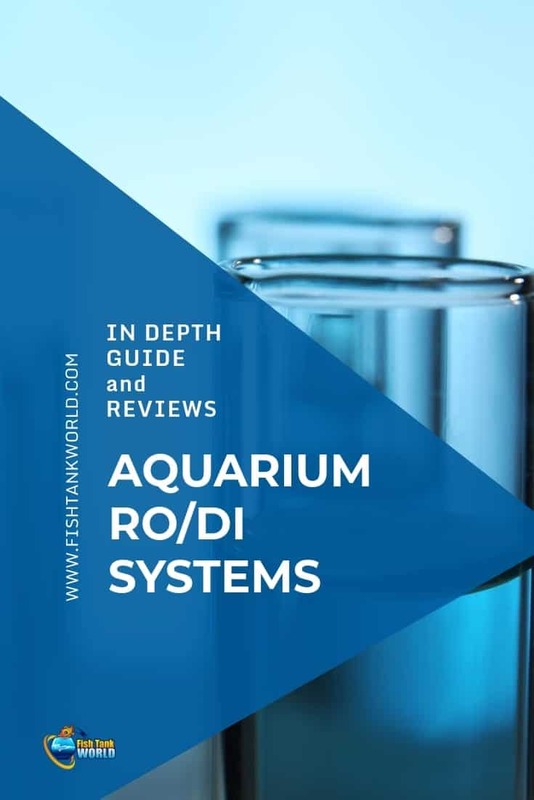 Whereas aquarists without a RODI system would have to fill their tank with specialised, filtered water, those who have installed a reverse osmosis system for aquariums can use water directly from the kitchen or bathroom faucet, provided it has been treated and filtered first. Reverse osmosis systems are typically used for saltwater aquariums, though they can also be set up for freshwater aquariums, too. 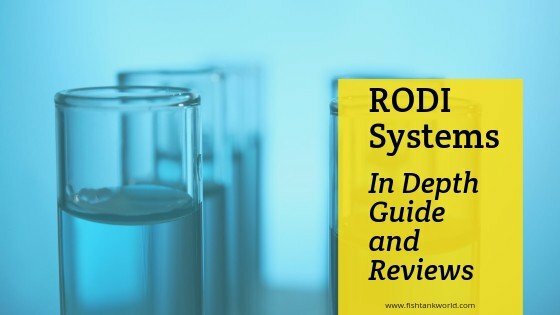 What is a RO/DI system? How does a RODI system work? Before we get into the details of RODI systems and the best buys available, here’s a quick breakdown of the common acronyms used in the industry. Knowing these acronyms will help you evaluate which RODI system is best for your aquarium. This explains the process that underpins your RODI system and the various stages of filtration that take place as water flows from one end to the other. Though not essential for all tanks, it is a process that can help to more quickly and easily produce filtered water that is safe for your aquarium environment and the health of your tank’s inhabitants. This refers to the measure of water that your RODI system can handle in a 24-hour period. It is normal to experience some minor variance in these figures, so take them with a pinch of salt. A measure of the cumulative volume of all the inorganic and organic compounds that are contained within your filtered or unfiltered water. This can include a range of chemicals, heavy metals and other substances, many of which can be harmful to the health of fish living within an aquarium. 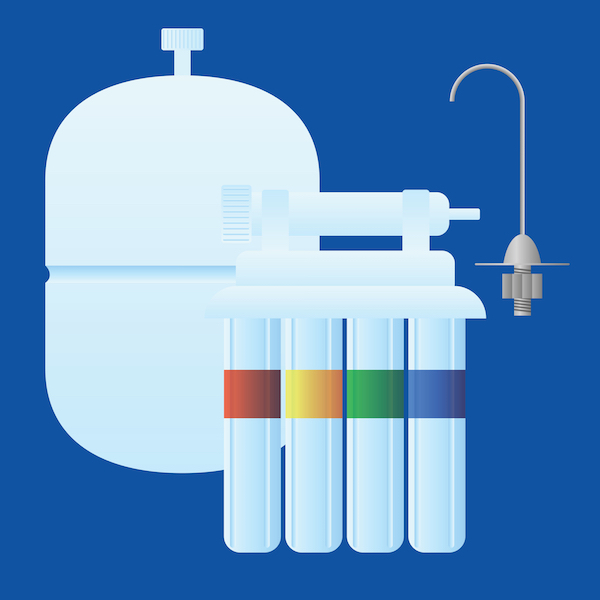 A RO DI system, or 'Reverse Osmosis and Deionization', is a sophisticated water filter that is capable of converting regular, unfiltered tap water into purified water of a higher quality. Unfiltered tap water is not considered safe to use in aquariums, as it can contain varying levels of impurities that are harmful for your aquarium and its inhabitants, as well as additives such as chlorine. They can also include heavy metals, nitrates and phosphates, the latter of which can both result in excessive algae growth, something that is undesirable in healthy aquarium tanks. Though some of these chemicals dissipate if left to stand for a long enough period, a RO/DI unit is a much more efficient means of removing all the impurities and chemicals, rendering tap water as a suitable means of filling your tank. Check out this video on what you need to consider before buying a RO DI system. A RODI system is typically made up of 4 different stages, with different types of filtration at each stage. Though you may often see mention of 5 or even 6 stages within a similar system, this just means that the unit is repeating or replicating 2 of the same stages. This can actually have some benefit, as it reduces the strain placed on those filters and can mean that they last longer between replacements. Once input water enters your filtration system, usually from a garden hose or kitchen faucet, it enters the sediment filter. This mechanical filter removes larger debris particles from the water, which makes it susceptible to blockages, so it requires regular changes. This can be every few months, or sooner, depending upon the water quality and level of use, and a good visual cue is to change the filter once it adopts a yellow/brown hue. In the second stage, the carbon filter, a carbon media removes organics and a variety of other toxins that have dissolved into the water, including chemicals regularly found in tap water such as chlorine. This is often the stage that is replicated in 5 or 6-stage filtration RO/DI systems, as the process can be particularly taxing for the carbon filter. It is also essential that your water is well-filtered at this point, as the following stage is sensitive to unfiltered water and can be the most expensive to replace. In the third stage the carbon filter is the RO membrane, where the water passes through a sequence of thin, film membranes that further purify the water. These membranes catch the vast majority of bacteria, heavy metals and sodium particles, amongst others. Despite their sensitivity, with good maintenance, these can last upwards of a year. Finally, the flow of water is divided after this stage, with waste water being filtered out and purified water being collected separately for use within your aquarium. Many aquarists note a marked difference in the taste of this water when compared to tap water, too. What’s more, although your waste water is filtered out, it is still nothing more than tap water and can thus safely be used for a range of other purposes around the house. All in all, RO/DI systems are largely very similar, both in appearance and functionality. Therefore, we’ve put together a list of the best RO/DI filtration systems that offer a wide range of variety and functionality, including models from both the cheaper and more expensive range of the market. This Ro/DI system is easily capable to reducing tap water to zero TDS, whilst including a PSI measure gauge that should be maintained between 40 and 60 PSI during operation in order to strike a balance between efficiency and not damaging the product. Getting the system unboxed and set up is straightforward, and although the connection hoses are short, external connector hosing can be used to allow for extra distance between your aquarium and this filter. One place in which this model could benefit is from the inclusion of a TDS meter, though external tools can be purchased. This is an essential piece of equipment for checking the level of chemicals in your aquarium’s tank water. This is a solid RO-DI filtration system that ticks the right boxes, but lacks a couple of nice-to-haves. One key point to take away is the pricing difference between the 50 GPD (Gallon Per Day) unit and the 100 GPD unit; with such a small gap between the two price tags, it’s worth considering the larger unit to future-proof your needs for larger aquarium tanks down the road. The Koolermax AR-122 Ro/DI System is capable of supporting 80 to 120 Gallons Per Day, with built-in filters and a pressure gauge for monitoring in-line PSI. This kit comes complete with installation hardware for convenience, and has a raft of other features that includes an automatic shut-off valve. All components and tubing are fitted tightly, with no leakage from connectors, and the whole design of the product is well-built, with aquarist users regularly reporting on the durability of this model against bumps, knocks and regular relocation. What the Koolermax doesn’t have is an inline TDS meter. In terms of other drawbacks, although instructions are included with the filter system, some users mentioned they are not the clearest and most easily understood. What’s more, separate tubing may need to be purchased if installing the system some distance from the aquarium. Aside from these minor niggles, this is an excellent unit. This model is a solid choice for small to medium sized aquariums, supporting 80 to 120 GPD with no reported leakage problems. There’s a bunch of features and extras included with product that are not always a given in filters at the cheaper end of the market, such as a pressure gauge and installation hardware, though a TDS meter would be much appreciated. All in all, this is a good RO/DI filter, though if you have a small, specific space to work with, you may need extra tubing to make it work. The SpectraPure RO/DI system does just as it says in the name, creating ultra-high purity water that is perfect for use within freshwater or saltwater aquariums; you can even taste the difference between the filtered and unfiltered tap water. The model includes a high-silicate removal membrane, sediment pre-filter and carbon block pre-filter. Installation is very simple, with instructions included to make the task easier, and many of the components already come pre-assembled, too. Though a flow control valve would be a nice addition to this model, it does have a PSI gauge, which is mounted in an easily-readable position on the front of the unit. The biggest gripe with this model is that there’s no waste water collector included, so you’ll need a place to filter this out to. If you’re after a RO/DI system that’s no-fuss to install, then this may well be the unit to choose. An easy to install system is supplemented by a partial pre-assembly, so you’ll be up and running in no time. If you’ve already got a nearby drain or waste water collector, then even better. What’s more the translucent design gives the appearance of glass, which makes the product appear more attractive. This RO/DI system is an extensive product with a wide range of filters, connectors and other components included in a very large package, all for a reasonable price. Guidance is clear and this makes the product very easy to set up, which is great given that none of the equipment comes ready assembled. What’s more, though this is a fairly expensive system, not only are you getting a lot for your money, but it also has a higher GPD capacity than many other models of an equal price point. Finally, build quality is excellent. This is one of the better models listed on our breakdown of good quality RO/DI filters, with few to none drawbacks to speak of, other than the very occasional minor drippage. You’ll also have to do all of the assembly by hand yourself. Otherwise, for a very reasonable price, you can pick up a RO/DI filter that is capable of processing a high capacity of water each day. This makes it the perfect choice for larger aquarium owners. The Abundant Flow Water RO/DI System is a 4-stage filtration system with simple mounting that makes it easy to secure on a wall or within an aquarium cabinet. Styled with a transparent, high-quality plastic design, the system is capable of handling around 100 GPD. It also comes with hose connectors that can be used to hook the system up to a hydroponics system, giving you multiple uses for the same equipment. All in all, it is well-designed, though it isn’t immune to problems with drippage. However, some amount of leakage is common with most models. The biggest drawback here is that the model is on the high price end. Though this model is expensive, the included mounting hardware means that it can have multiple uses for hobbyists who may also be into growing with grow light or hydroponic systems. When talking specifically about tanks, the GPD capacity is reasonable for the money, but the build quality, and ease of installation and mounting, is what makes this system worth buying. As seems to be the case with many RO/DI systems, although instructions are included with this model, it can be difficult to follow the guidance contained within them. This is likely due to the product originating from China, which is also the reason that replacement parts can take a long time to arrive when ordered. In terms of build quality, it’s not the most attractive design, however its small stature does make it easy to mount the unit beneath aquarium tanks and inside of small equipment cabinets. Also, where the physical instructions are lacking, the company more than makes up for it by including extensive self-help support online. This model isn’t going to win awards for the most original or feature-rich design, but it’s inexpensive and perfect for smaller tanks, especially given its small footprint and simple installation process. What’s more, seeing a highly-useful self-help system included as part of a product is a rarity, and it helps to soften the blow of not having the clearest installation instructions, particularly for a product that does no self-assembly. If you do get stuck, just seek out the self-service support system offered by the manufacturer which is excellent. The TYPHOON 5 Stage RO/DI System is best suited for smaller aquariums, with a capacity of around 75 GPD. Getting things up and running is easy, with a straightforward installation process and instructions available. That said, the instructions are not of the highest quality and can be difficult to follow in places. The design of this unit allows an insight into the inner workings of the filter, with a translucent appearance, too, and there should be no problems with drippage or leaks. However, despite the lower GPD capacity, this system does have a tendency to produce more waste water than many other RO/DI systems, even those with a better GPD capacity. Owners of medium to very large aquariums may want to consider a larger RO/DI system capable of filtering larger volumes of water more quickly, though this unit is perfect for the smaller tank. Budding aquarists may also appreciate the design of the unit, given that it provides an insight into the flow of water through the system. If you do opt for this model, then be sure to have a large waste water catcher, as this unit does tend to produce a great volume. This extensive product includes multiple filtration stages and is designed with a range of extras that help to justify the higher price tag. This includes longer lasting filters and high-quality connect fittings that help the product to run for longer before filters need replacing. The filter also comes with a manual flush valve that further helps to increase the unit’s lifespan and reduce the possibility of leakage. To finish this great package, the system comes fully pre-assembled with its 6-stage filtration system. For such a heavy-duty model with a high GPD capacity, it’s a shame to see that this model doesn’t have something as simple as physical instructions or mounting hardware included within the package. However, this small setback doesn’t do enough to detract from the positives of this filter, with a high-quality design and very quick and efficient installation process. Should you in fact run into problems with installation, instructions are still available directly through the manufacturer’s website. When you set up a new aquarium, there are pieces of equipment that should be considered as essentials, including a filter, be it mechanical or biological, a lighting system, a heater or chiller, a pump system. However, a RO/DI filtration system is not an essential part of owning both saltwater and freshwater tanks. They simply make it far easier to produce a clean supply of fresh tank-safe water for your fish, without having to visit a wholesaler or specialist store. Your decision of which RO/DI filter to buy will most likely be largely influenced by the size of your tank and the regularity with which you want to be sourcing replacement filters. It’s good to remember that although more than 4 stages are not a strict requirement, the duplication of the carbon and sediment stages can result in a longer window between ordering replacement components. That aside, the key statistic to pay attention to is the GPD, or Gallons Per Day, which will tell you roughly how long it will take to fill an aquarium of your size. Once you’ve fully filtered out the harmful toxins and chemicals that are often present in tap water, you’ll be ready to fill your new aquarium tank.